Derek and I had planned to hit Virgie’s BBQ based on their appearance in the Texas Monthly top 50. 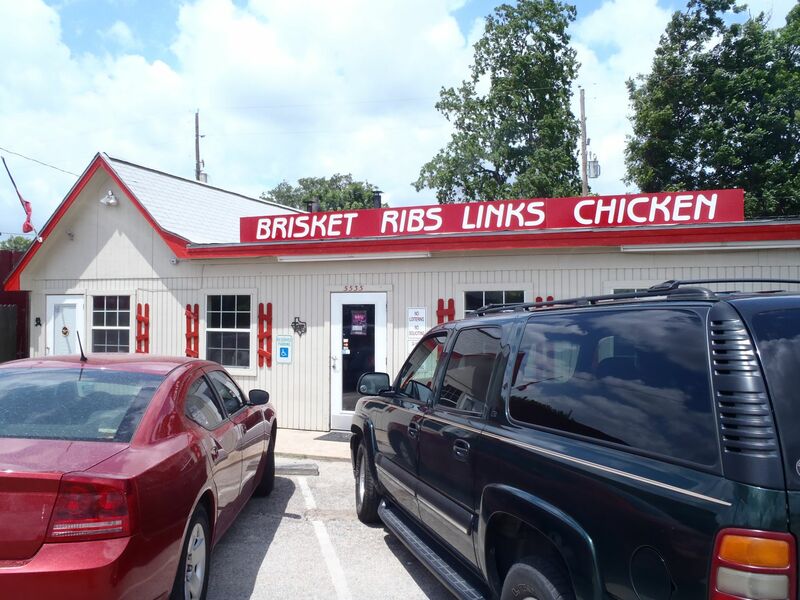 We’ve been trying some of the closer joints around town and there are only a few listed in and around Houston; Gatlin’s, Virgie’s, Brook’s Place (Cypress), and Corkscrew (Spring). 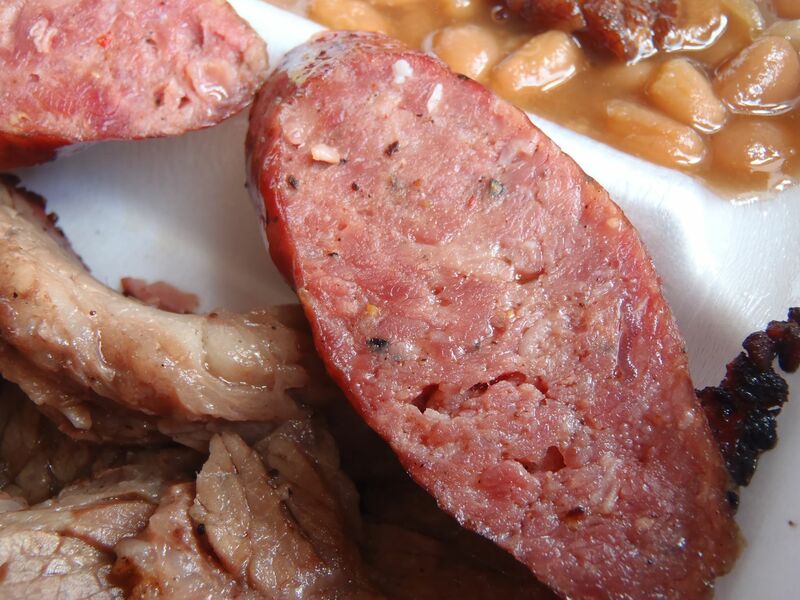 Once we exhaust these known spots it’s on to some of the others that have good reviews but didn’t make the top 50 such as Burns BBQ, Barbecue Inn, and the Swinging Door. I was riding my Bandit 1200 due to my run in with a screw on the BMW, and met Derek on the way to Virgie’s. A nice couple of back roads and a short ride led us to a humble building with a gravel lot. Checking around back I saw their woodpile but their smoker was protected from prying eyes and likely any thieves. It looks like they do more business during lunch rather than dinner as the neighborhood is a bit industrial. On the front door they had proudly displayed notice of their top 50 ranking, and inside they had a stack of postcards for the Prophets of Smoked Meat, the new book from Daniel Vaughn who was a former BBQ blogger and current BBQ editor for Texas Monthly. We walked in to a full lunchroom right at 12:15. With only 10 tables in the small dining room it fills quickly. 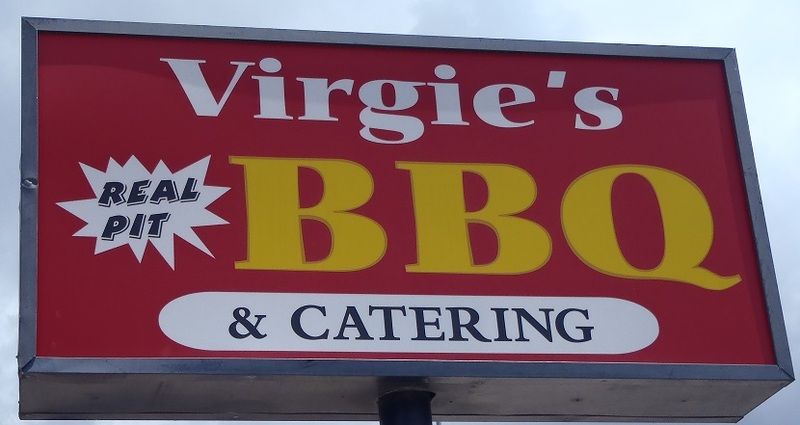 Virgie’s has been a BBQ joint since 2005 but their history includes a grocery store and started as a burger joint in 1965. The staff was very friendly and while it took some time, our order arrived without significant delay. We both ordered a two meat plate. Derek chose brisket and rib, while I asked for fatty brisket and sausage. Without stipulating slices from the fatty end, Derek’s brisket was dryer than he had hoped. My fatty brisket was better, but the cooking was inconsistent. Parts of it had perfectly rendered fat and carried a nice smoky taste, but other parts of the same piece contained less rendered fat. It was as if they were crowding their pit in order to meet the demands of their recent accolades, and this was causing the meat to be cooked unevenly. Since I didn’t get to take a look at their pit I cannot state this as a fact but I could see this as a potential reason. 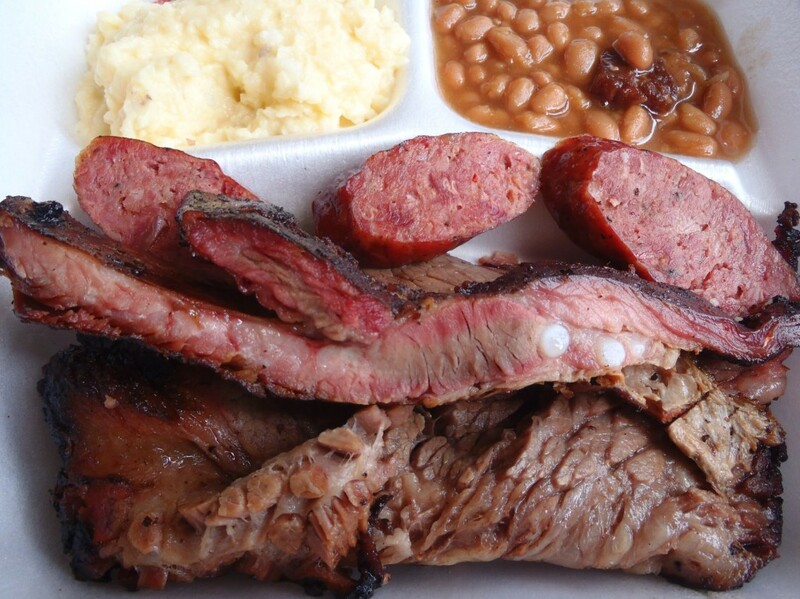 Franklin BBQ was busy adding pit space as the Texas Monthly BBQ issue was being printed, and Snow’s had expanded since they broke through in 2008 so unless Virgie’s had already expanded it was possible that they were feeling the crunch of their popularity. Derek and I swapped some of the pork rib and sausage. The rib, in the meatiest section, was delicious. But like the brisket there were parts of it that were not cooked as well. The ends were overcooked and too dry. If we had more ribs it wouldn’t have been such an issue but we were both sharing his order so it left us wanting. The sausage was good. It wasn’t terrific but it was very good. The filler looked very complex and had a number of flavors. Our server confirmed it was made offsite but to their specifications. If I had to choose two options here it would be the brisket and ribs. The sauce was ok, but very sweet. We had forgotten to even try it until we were almost done with the meat. Sides were unremarkable, as have been at a number of visits to other restaurants. The potato salad and beans were typical of any of a number of other joints. I’d like to come back sometime and see if the uneven cooking was a one-off incident but I am not sure when I will have the chance. There are a number of other locations I need to visit for the first time but also a handful that I want to come back to that I would give a higher priority than Virgie’s. If you’re anywhere remotely close to the area it’s certainly a much better option than the chain-restaurant alternatives.